Interview: Kyle Higgins Talks Cold War and Doomsday Weapons in THE DEAD HAND – What the Heck is going on?!? The Dead Hand is the latest comic series written by Kyle Higgins with art by Stephen Mooney, colors by Jordie Bellaire, and Clayton Cowles doing the letters. Dealing with the Cold War and the time afterwards, it’s been an intriguing look at how some characters were originally involved in the conflict and where they’re at today. I talked to Kyle Higgins about the story during San Diego Comic-Con. Issue #5 is on sale August 8. 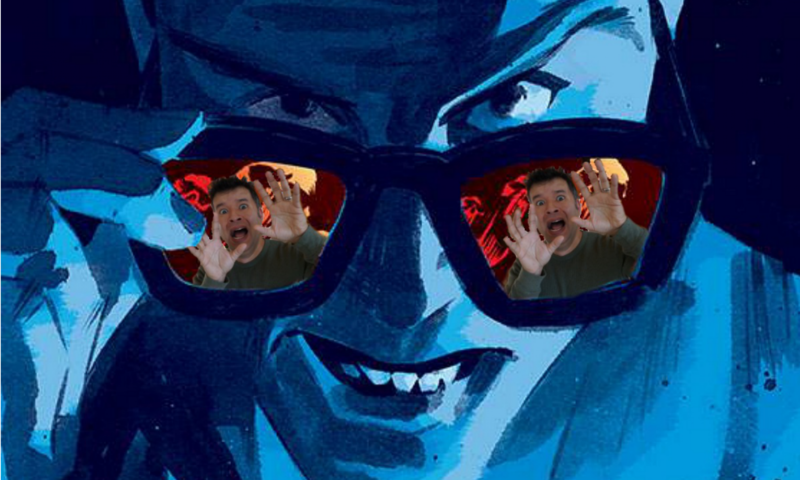 GManFromHeck: Why did you choose the era of the Cold War to write about? What is it about the time period that gave you the story? Kyle Higgins: I’ve been fascinated with the Cold War for a long time. I think any sort of dynamic where you have an alternate version of a character, world, or country is fascinating to me. The immovable force versus the unstoppable object, right? From the 60s to the 80s, in particular, the Cold War between the U.S. and the Soviet Union was like looking in a mirror. We didn’t really understand each other. We just knew what we were told. It’s a fantastic era for intrigue and spy stories. More importantly, I wanted to explore the era as the Cold War was ending. When the proliferation of weapons and scientists was happening as the Soviet Union was collapsing. [Stephen] Mooney and I love stuff like James Bond and Metal Gear Solid so we built a story around that. The idea of doomsday weapons during the Cold War, some of which the Soviets built and some which they only theorized and talked about building, was the MacGuffin that had always been in the back of my mind. There was this concept of a dead hand, and it all just coalesced that way. We had a bit of a twist in the beginning when we see some operatives working together and then working against each other. Cut to a few years later, they’re now living in the same town. That’s part of the mystery because we don’t know how they got from then to now. No, you don’t know that, and I don’t know that you will. I’m writing the book in a different style. It’s a little more novelistic. It can go between eras pretty fluidly because of the way I structure it with narration. A lot of questions get answered in issue #5. Especially how are these people here and why. We see a lot of creator-owned books that are finite. With this one, do you have an endpoint in mind? We’re going to end it with issue #6, but it’s ended “for now.” There are a lot more stories to tell with these characters and within this world. Based on sales and the natural story endpoint, we’re going to wrap-up at issue #6. But all of the questions won’t be answered? A lot of them will. I will say, it’s a fun book. Stephen Mooney and Jordie Bellaire are just killing it on the art. Clayton Cowles on the letters. It’s a fun Cold War spy-rom. It’s a different approach for all of us. We’ve been experimenting. It really is a blast. I always feel very fortunate and lucky to be able to do work with Image Comics. This one is no exception. I don’t know if this was something you were always fascinated with or once you started you dug deeper. A little bit of both. I research as need be. I did have a sort of passing knowledge and familiarity with some of these doomsday weapons and stuff like that before starting this book. Anything else you have going on? “Shattered Grid” for Power Rangers is wrapping up. My film, The Shadow Hours, is live on TheShadowHours.com. I also have a top secret new thing coming up that I already wrote the first issue for. It’ll be announced in the next couple months. Be sure to pick up The Dead Hand #5 this week. The trade paperback collecting issues 1-6 goes on sale October 3, 2018.